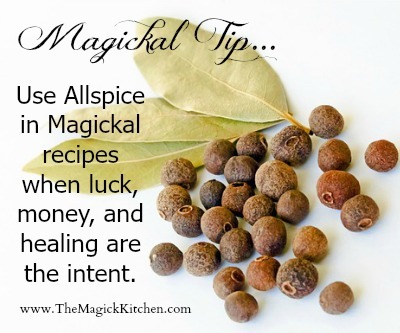 When mincing your Magickal herbs for spells and recipes, toss some salt on the cutting board to keep them from flying around. 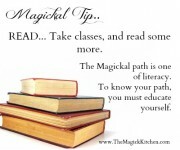 Magickal Tip: Read, Read and Read Some More! 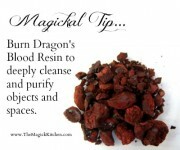 Use Sacred or Holy Water in recipes, spells, and rituals where water plays a key role. Learn to make your own Sacred Water with this simple tutorial. Mold and carve Bee’s Wax with Magickal symbols. Then toss it into a fire for an instant spell. 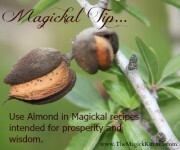 The Magick Kitchen Magickal Tips Use Almond in Magickal recipes intended for prosperity and wisdom. 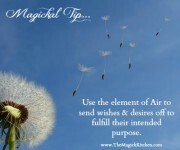 Use the element of Air to help carry your wishes and desires. 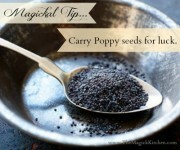 The Magick Kitchen Magickal Tip Carry Poppy seeds when you need to attract luck.